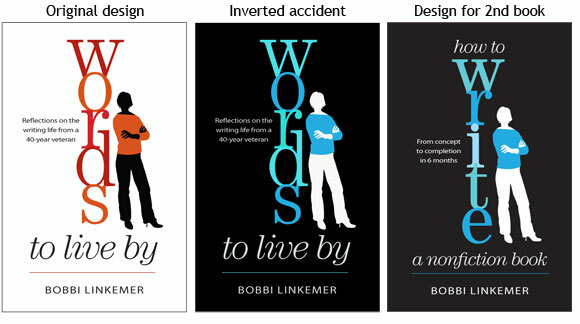 Author and ghostwriter, Bobbi Linkemer, hired me to design a cover for her memoir, Words To Live By. The concept was a typographic solution: one word of the title, “words” was emphasized; the point size was dramatically larger than all the other type, and the letters were stacked vertically. Next to it, I added a silhouette of a woman who reminded me of Bobbi. Colors were based on Bobbi’s preference for dark red and rust tones. While I was making jpegs of the cover (for web usage), I accidentally inverted the cover in Photoshop. Everything that was white became black, and the reds turned to teal and blue tones. Although it was an “accident,” it was a cool effect. A few weeks later, Bobbi was in the process of updating and reprinting a new edition of How to Write a Nonfiction Book and asked me to redesign the cover. While we were looking for visual ideas, I mentioned the Photoshop “accident” and showed Bobbi the inverted cover in black and teals. She loved it and immediately decided to use that design solution for her book. This design will be easy to adapt for future book covers by changing the color palette and title. We’ve created a visual brand with color, typography, and consistent imagery. Next time, it won’t be an accident. See more examples of our work. Contact N-K about designing your book cover, 314-548-6001.